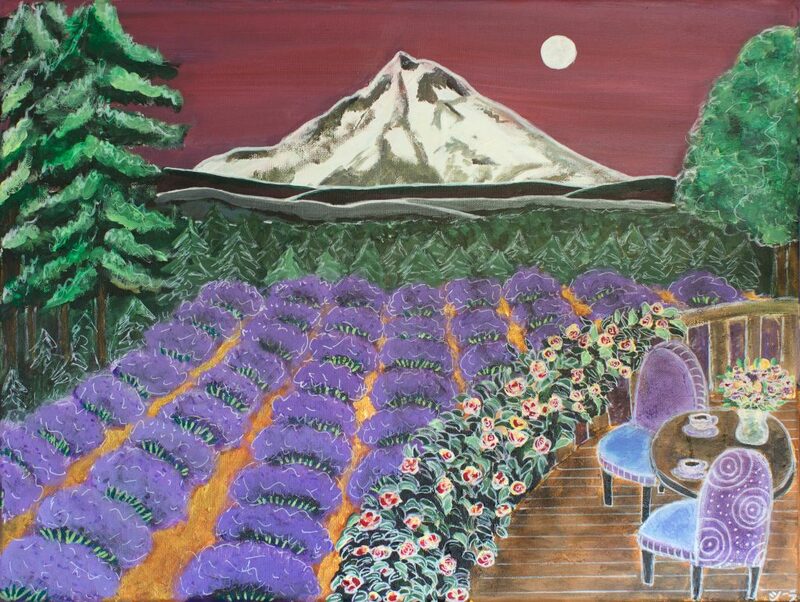 Sheila Baumgardner, “Lavender Field,” acrylic on canvas. The City of Hillsboro Cultural Arts Division is pleased to announce an exhibition of landscape paintings by Sheila Chugani Baumgardner, curated by Cultural Arts staff. The exhibition will be on display through the months of March and April in the Hillsboro Civic Center’s Shirley Huffman Auditorium and adjacent gallery wall. The Civic Center is located at 150 E. Main St. in Hillsboro, and is open to the public Monday through Friday, 9 a.m. – 5 p.m.
Baumgardner paints whimsical acrylic landscapes inspired by the urban parks of Portland and the natural wonders of Oregon, and reflective of her cultural heritage and upbringing. The series of paintings on exhibit invites viewers to imagine they are relaxing on a couch at home while being immersed in the joy and beauty of the Oregon landscape. Born in India, Baumgardner spent most of her formative years in Japan and now lives in Portland. She cites as an inspiration the work of American painter Thomas McKnight, known for pop-influenced interiors framing views of brightly hued landscapes, including scenes of Kobe, Japan. Baumgardner strives to imbue her work with cheer, and her work reflects the style and joy of the cultures and places that have influenced her along the way. Fake News: Threat to Democracy or Passing Fad? Previous PostPrevious Fake News: Threat to Democracy or Passing Fad?